GTX10055 is currently not offered. Specificity/Sensitivity: This antibody binds human D-dimer. Cross-reacts with directly coated D-monomer but not with directly coated fibrinogen. Specificity/Sensitivity: This antibody binds human D-dimer. 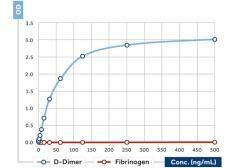 Cross-reacts < 2% with directly coated D-monomer but not with directly coated fibrinogen. Specificity/Sensitivity: This antibody recognize D-dimer and high molecular weight fibrin degradation products. It does not cross-react with fibrinogen. Specificity/Sensitivity: This antibody recognize D-dimer and high molecular weight fibrin degradation products. It cross reactswith fibrinogen. 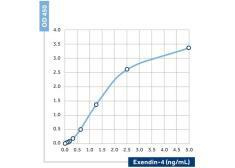 Specificity/Sensitivity: Specific for exendin-4. No cross-reactivity with GLP-1, GLP-2 (human) or glucagon coated on ELISA wells. Specificity/Sensitivity: Recognizes high molecular weight fibrin degradation products. Recognizes D-dimer in Westernblot under non-reducing conditions. Interacts with beta-chain of D-dimer in Western blot underreducing conditions. Does not cross-react with fibrinogen and D-monomer. Specificity/Sensitivity: Recognizes high molecular weight fibrin degradation products. Recognizes D-dimer in Western blot undernon-reducing conditions. Interacts with beta-chain of D-dimer in Western blot under reducing conditions.Does not cross-react with fibrinogen and D-monomer. Specificity/Sensitivity: Recognizes Human fragment D-dimer of cross-linked fibrin. Reacts equally well with fragment D of non-cross-linked fibrin. Minor reactivity with fragment D of fibrinogen or with fibrinogen has been observed.Does not cross-react with rabbit fibrin or its degradation products.